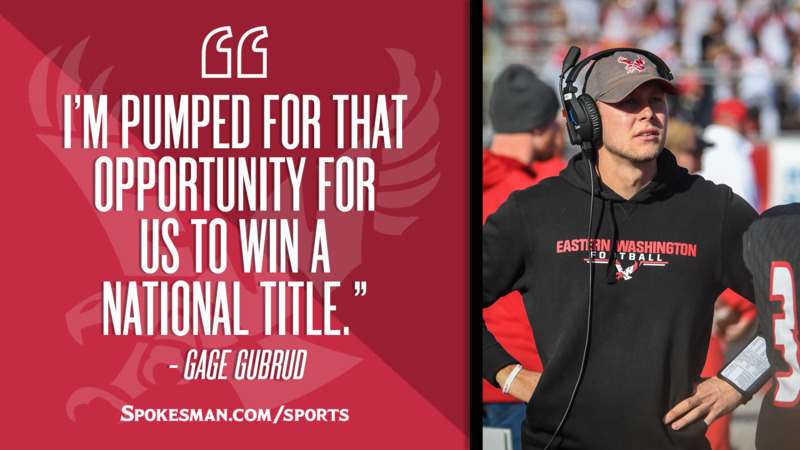 But Gubrud, who set a FCS single-season passing record of 5,160 yards and 48 touchdowns that season, was fixated on a different trophy, one EWU would have had a chance to hoist that weekend if the Eagles hadn’t fallen 40-38 to Youngstown State in the closing seconds of the semifinals. When EWU (12-2) faces powerhouse North Dakota State (14-0) on Saturday in the national title game, Gubrud, who suffered a season-ending toe injury Sept. 29 at Montana State, will continue to aid budding sophomore quarterback Eric Barriere as he attempts to the win program’s second FCS title. Gubrud’s ailment received the most attention – and temporary panic from EWU fans before Barriere filled in nicely in relief – on a team plagued by a rash of season-ending injuries. Gubrud and fellow senior captain Mitch Fettig, a three-year starter at safety, were student-athlete faces of the program going into the season, both representing EWU at Big Sky Conference Media Day. Fettig’s college career ended in the regular-season finale at Portland State when he ruptured his Achilles tendon while trying to shed a block in the first half. EWU’s injuries began piling up early. • Sophomore safety and nickel linebacker Anfernee Gurley, a third-team All-Big Sky selection last season, suffered a season-ending knee injury in August. • Junior linebacker Jack Sendelbach, who twice earned Big Sky Conference Defensive Player of the Week last season and had a career-high 13 tackles against North Dakota State, also went down in August, with a back injury. • Junior left tackle Tristen Taylor, a 6-foot-7 310-pound wall, was a preseason first-team All-Sky selection who suffered a season-ending knee injury in September. • Senior receiver and punt returner Zach Eagle hasn’t suited up since his knee injury at Montana State in September. He averaged nearly four receptions a game before the injury. • Senior middle linebacker Kurt Calhoun. who had 132 tackles and nine tackles for loss in 18 starts, announced that his college career was over in October due to a spinal condition. • Senior defensive end and Cheney product Keenan Williams was a first-team all-Big Sky Conference selection before a leg injury at Portland State cut his career short. • Senior rover Cole Karstetter hasn’t played since suffering an injury at Portland State. The two-year starter missed the playoffs, but is listed on EWU’s depth chart this week. • Junior Tysen Prunty, who started nine games at safety this season, missed the playoffs after being injured at Portland State. He has returned to practice, however, and is currently listed on the depth chart. • Junior running back Tamarick Pierce went down with a knee injury in the semifinal win over Maine and won’t return for the title game. Pierce, the most downhill-style runner in EWU’s talented backfield, rushed for 550 yards and seven touchdowns on 70 carries, the best average (7.9 yards per carry) in program history. EWU still ranked second in the FCS in offense at 44.5 points and 540 yards per game, yielded a Big Sky-best 16.8 points per game in conference and handled playoff foes Nicholls State, UC Davis and Maine by a combined 124-69. With a once-senior-loaded team now littered with contributing underclassmen, Fettig and Gubrud are now embracing their de facto coaching role. Published: Dec. 31, 2018, 7:38 p.m. Updated: Dec. 31, 2018, 7:57 p.m.